Looking for a healthy, delicious breakfast treat for your kids? 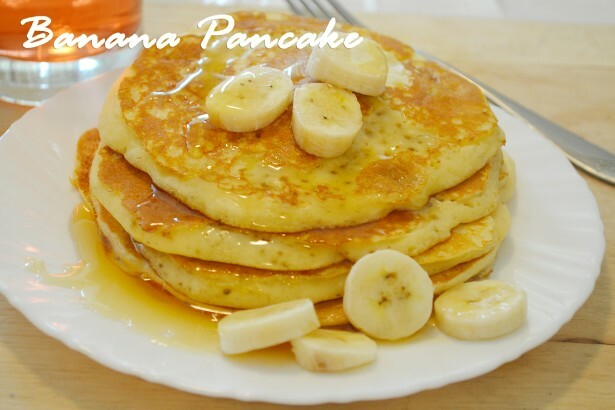 Here goes the moist, fluffy banana pancake recipe that is super quick to prepare. It tastes delicious with soft inside and crispy outside. The flavor of banana & vanilla makes a heavenly combo that your little ones will enjoy. Check out the quick, easy video recipe & enjoy the gluten-free banana pancakes. Beat egg and keep ready. Mash banana in mixing bowl and set ready. In another bowl, add whole wheat flour or maida flour. Add salt, sugar, cinnamon pwd and baking pwd. Add whole milk and stir gently. Add beaten egg and mashed banana. Combine together to make smooth batter. Melt butter in dosa pan or frypan. Spread to small thick discs. Cook in low flame to golden. Once it is cooked on both sides, remove from flame. Fluffy delicious banana pancakes are ready. Serve hot with drizzling honey & with a dallop of butter. It makes a healthy breakfast / dinner or snack recipe for kids & adults.